I'm Jennifer Smith. I'm from Corpus Christi, Texas. I regularly have a booth at the Corpus Christi Downtown Artwalk and always participate in the Corpus Christi Festival of the Arts. I love being part of community events and sharing my artwork with others. My business is the collaborative effort of my family. I'm blessed to be surrounded by so many creative folks! Our website is www.laurelynn.com. Jennifer L. Smith has designed handmade art-to-wear for over fifteen years. She enjoys working in wire, metal, fiber and semi-precious gemstone beads. She won a Bronze Medal Award in Fire Mountain’s Pearls 2011 Contest and was a finalist in the 2011 and 2012 Bead Star Contests. She loves to show her work at outdoor art festivals including the Rockport Art Festival, the Corpus Christi Festival of the Arts, and monthly at the Corpus Christi Downtown Artwalk. Her artwork has been exhibited at Corpus Christi Creative Connections and the Art Center of Corpus Christi. She served on the Board of Directors for the Corpus Christi Festival of the Arts in 2012. Jennifer earned her MA in 2004 from Texas A&M University-Corpus Christi. She draws inspiration from nature when designing her handmade art-to-wear and mixed media artwork. Her methods include using recycled metal, wood, and other items as tools that she makes herself. 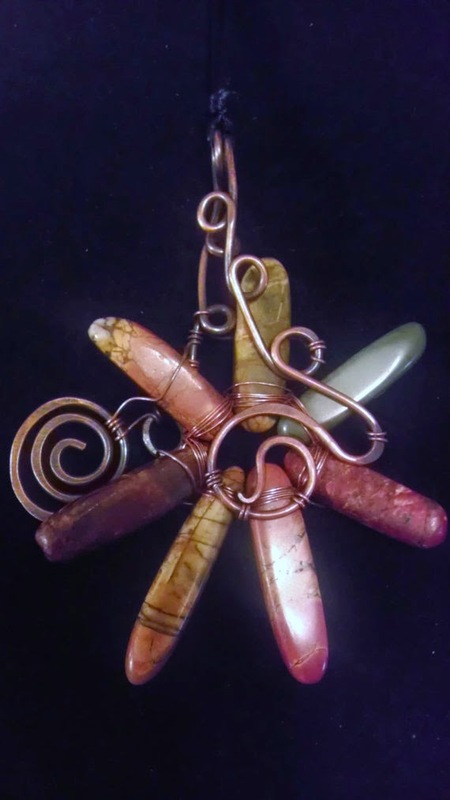 Her copper and gemstone flowers are featured in both necklaces and wall hangings. Please visit her website at www.laurelynn.com.